Tart Cherries to the Rescue! Over the years, I’ve been hearing that tart cherry juice is excellent for health because of its antioxidant properties. Last weekend gave me an excellent reason to give it a try, with whole cherries, not just the juice. Saturday was a gorgeous day to get out on the 16 mile Loop Trail that circles our town. The gravel trail was dry, nicely packed, and the weather wasn’t too hot. I hadn’t planned on doing two loops because I like to mix it up from day to day. I’ll bike one day, hike the next, swim, and so on so that I can let one set of muscles rest while I’m using others. I’ve found that doing this as I get older makes a big difference in my muscle recovery so that I can be active every day. But, on Sunday, our Mother’s Day picnic plans created a perfect opportunity for a destination bike ride to the county park via the Loop Trail, once again. When I got home from the Sunday ride, I thought that I’d better juice up my post-workout smoothie with anything that could help. My legs were pretty tired and I needed to be ready for my Monday morning strength training class. Nutrient timing to the rescue! The cherry juice idea popped into my mind and I thought, “Why not?” I’ve needed a better reason to use those frozen pie cherries from our North Star Cherry tree other than pouring 2 cups of sugar on them and wrapping them in butter and flour for a pie. Lest you think that I’m above making a cherry pie, the other reason that these cherries continue to accumulate in my freezer is that I usually have time only to pick them, but not pit them. That is going to change this coming June! Anyway….I pulled a cup of cherries out of the freezer, put them in a quart size mason jar, covered them with boiling water to thaw, hand pitted them while keeping an eye on some ominous clouds to the north that the weather radio said could form a tornado (didn’t-whew! ), added some yogurt, water, whey, a very ripe banana, some extra stevia, blended with my stick hand blender (that I can’t live without), and WOW! It was delicious and filled with 350 mg. of calcium for your bones. The variation with added yogurt instead of whey has 450 mg. of calcium, which makes a good case for whole foods, once again! But, I keep the whey around for an easy protein boost in my post-workout smoothies. Organic Bourbon Vanilla Whey-my favorite! The best part of this story is that when I woke up last Monday morning, my legs weren’t tired, sore, achy, or even a little heavy feeling. Was it the cherries? There’s no one superfood, but eating as many as good foods as possible sure can’t hurt! One thing I do know, it was so yummy that it was worth the effort to pit those few cherries. 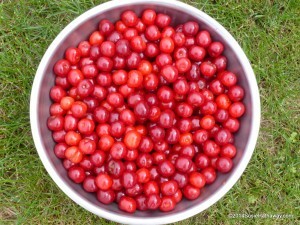 If you want yours pitted, see the links below for the canned or dried cherries. 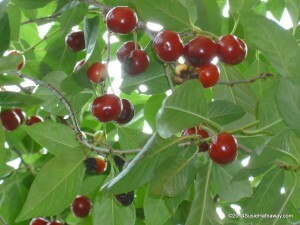 Pinch of stevia for sweetness-those cherries were pretty tart! If your cherries are sweetened, you won’t need the stevia. Add ice if you like. 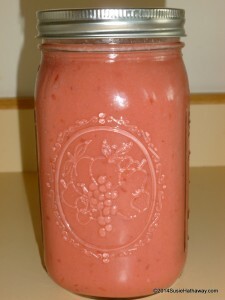 As the ice melts, it makes the smoothie more refreshing and helps with rehydration after exercise. Blend until smooth. Carbohydrate: 60 g. Protein: 19 g. A nice ratio of 3:1 Carb:Protein recovery drink. Registered sports dieticians recommend a 2:1 to 4:1 Carb:Protein ratio for post workout nutrition. Makes 1 quart. Have a little before and the rest after a workout. Calories: 320 to 400, depending on the yogurt used and if your cherries have added sugar. Variation: No whey? No problem! Simply substitute 1/2 cup plain yogurt, 1/2 tsp. vanilla extract, and 1/8 tsp. stevia for the whey. Often, yogurt is produced with added milk powder, hence the higher protein content of 10 g. per cup. I used homemade yogurt, so mine was only 8 g. per cup. But, for the added benefit of fiber, use whole cherries! If you have a good smoothie recipe that you’d like to share, or even a few special ingredients, please add it to the comments below! Thanks! ← Do Resistance Bands Build Bone Density?